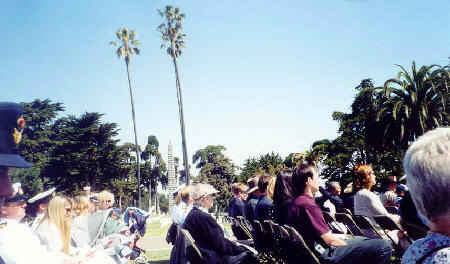 An Anzac Day Commemoration Ceremony was held on 25 April 2003 at Ft. Rosecrans National Cemetery, located on Point Loma in San Diego. Approximately 80 people attended this ceremony and I was asked to represent the Great War Society. 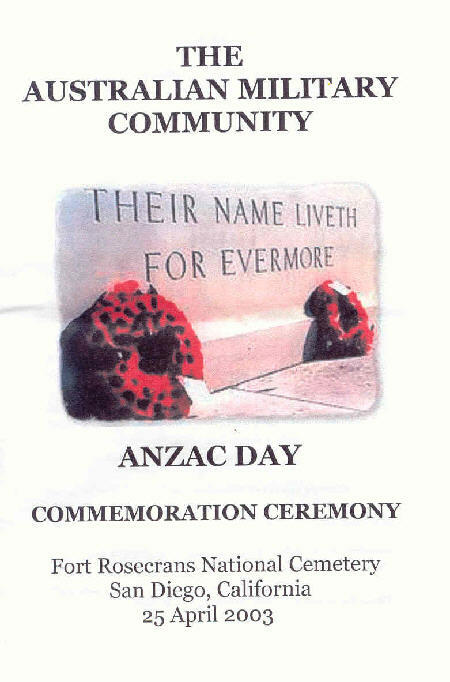 This Anzac Day marked the first time the ceremony was held without a surviving Anzac in attendance; the last veteran passed away during the year. Sprigs of rosemary signifying remembrance tied with a red ribbon were passed out to all attendees. The ceremony began with the entrance of Servicemen and Service women followed by the Catafalque Party, which was posted at the Stone of Remembrance. 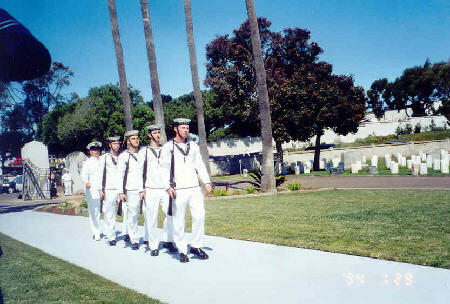 The Catafalque Party consisted of Royal Australian Navy sailors who are attached to the Fleet Training Center, Pacific. Wreaths were laid by John Olsen, the Australian Consul-General and Rob Ayling, the Honorary New Zealand Consul-General to signify the joint significance of "ANZAC". 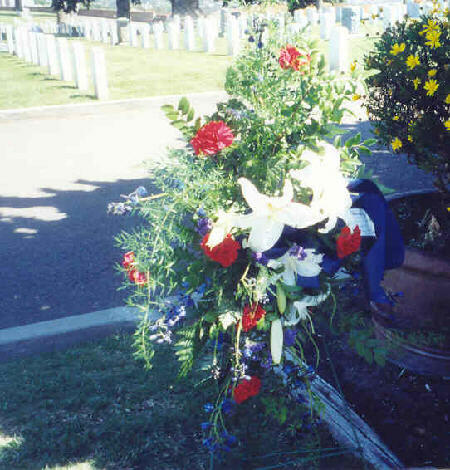 Wreaths were also laid on behalf of the United States Navy, the Australian Defense Force and the Australia New Zealand American Club. Additional flowers were laid by individuals, including an arrangement on behalf of the Great War Society. Lieutenant Scott Palmer, RAN read the requiem remembering the Australian and New Zealand men and women who died or suffered at Gallipoli, as well as in other military conflicts, including Afghanistan and Iraq. The requiem ended: "We remember staunch friends and allies, especially those who fought alongside us on that first ANZAC Day in 1915. Our servicemen and women have left us a splendid heritage. May we and our successors prove worthy of their sacrifice." 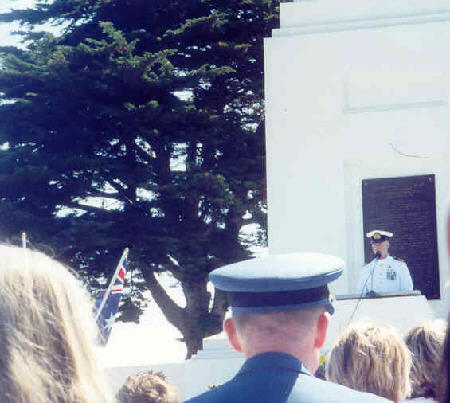 After a prayer led by CDR Robert H. Feagle, Chaplain USN, Matt Ross of the Boy Scouts of America recited the following lines from Laurence Binyon's "For the Fallen"
The ceremony ended with the Last Post, two minutes of silence, Reveille, and the singing of the Australian, New Zealand, and United States anthems.